YouTube analytics is a powerful tool available to every content creator for free, that may indirectly help you grow your channel to considerable size (or save it, if it starts being less and less popular). People with analytical skills can easily find a reason why videos don’t get more views than expected or why the channel stopped growing altogether. 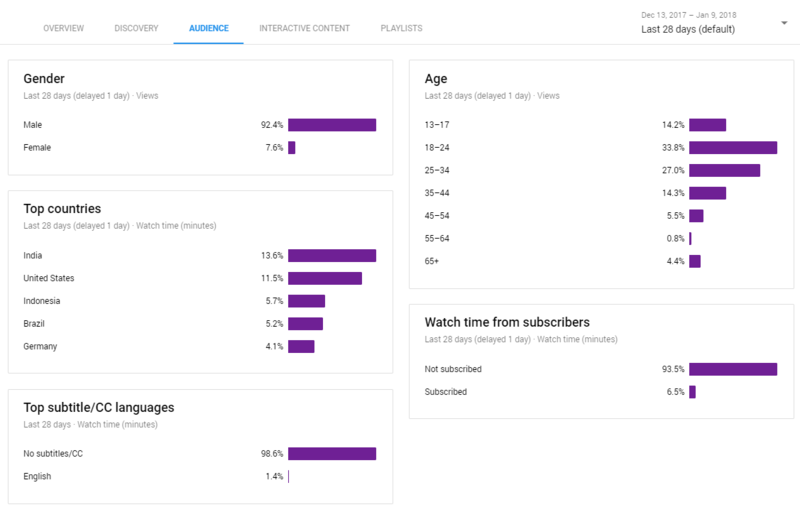 What can you find in YouTube Analytics? To learn more about usability of this great tool keep following out blog post! 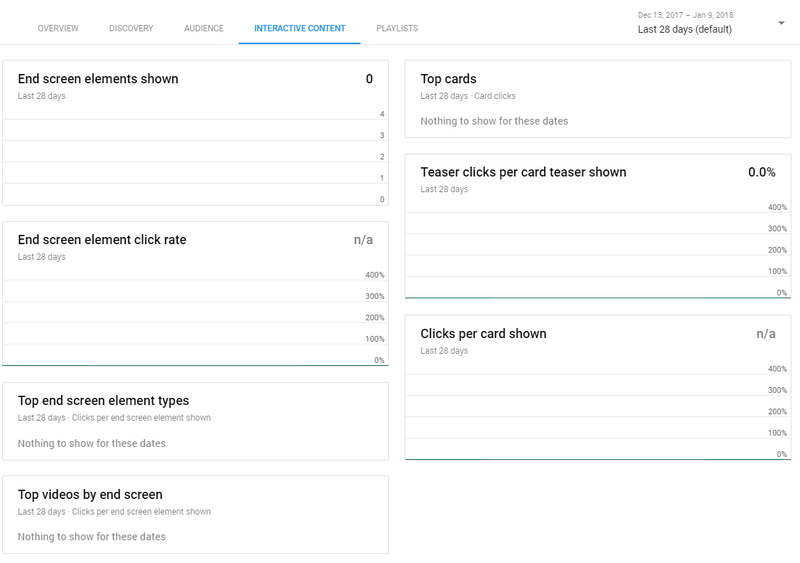 To look up you basic window of your statistics simply sign in to your account, click on Creators Studio and search for Analytics tab on the left side of your screen. 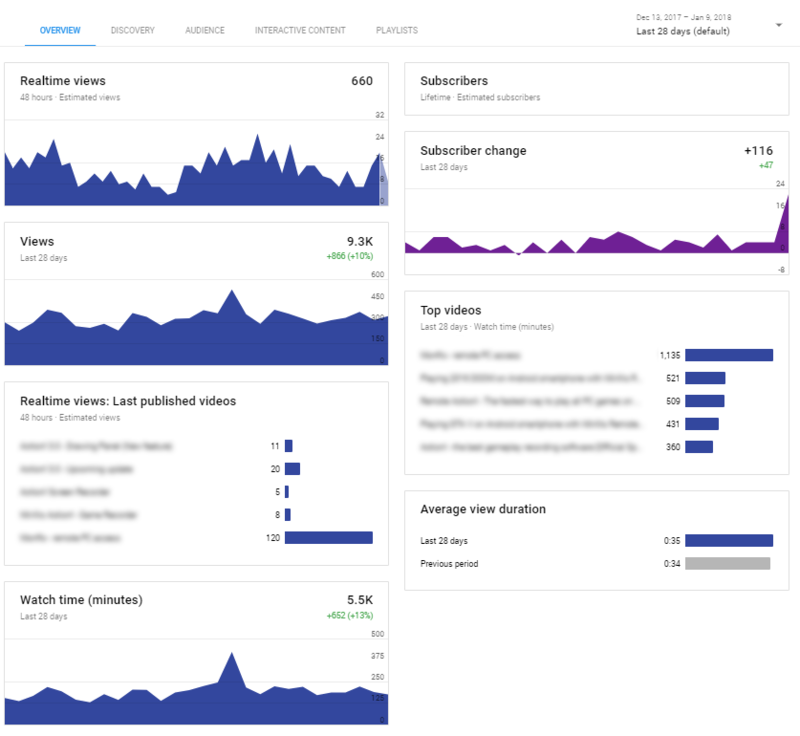 The overview screen of new YouTube Analytics tab shows information such as Realtime views, Lifetime Subscribers, Subscriber change, Views, Top videos, Realtime views for latest videos, average view duration and Watch time. You can set a different time period which interests you the most. What can you see from those statistics? How many subscribers do you have compared to views? Situation 2: Much more views than subscribers – While you might say that your channel does indeed show up well in YouTube video search, and the content is enjoyable for others, you still need to take care of ways to keep people on your channel. Try to encourage people to “subscribe and turn on notifications to never miss on a new video”. Which videos are viewed the most and which have actual longest watch time? Situation 1: Many views, short watch time – This might mean that your videos are too long, you particular moment within the video isn’t interesting enough. Did you know that it takes ONLY 4 seconds of “bad”content to discourage new viewer to continue watching the video? Situation 2: Lots of views, and almost full watch time – although it seems like a dream situation, it happens sometimes. However, this doesn’t mean that your channel is already perfect. Do you want your channel to grow, or satisfy 100% of your current subscribers? Consider making the videos a bit longer (around 60 seconds every several videos) and see if the watch time and subscriber gain increases. Second tab in new YouTube analytics (currently in BETA phase) allows you to see how people find (discover) your videos (doesn’t include subscribers). Here you can find several charts such as Traffic source types which allows you to see where you viewers come from, whether its search engine (google, yahoo etc.) or from YouTube search, Top external sources chart, which essentially expands the Traffic source types chart. 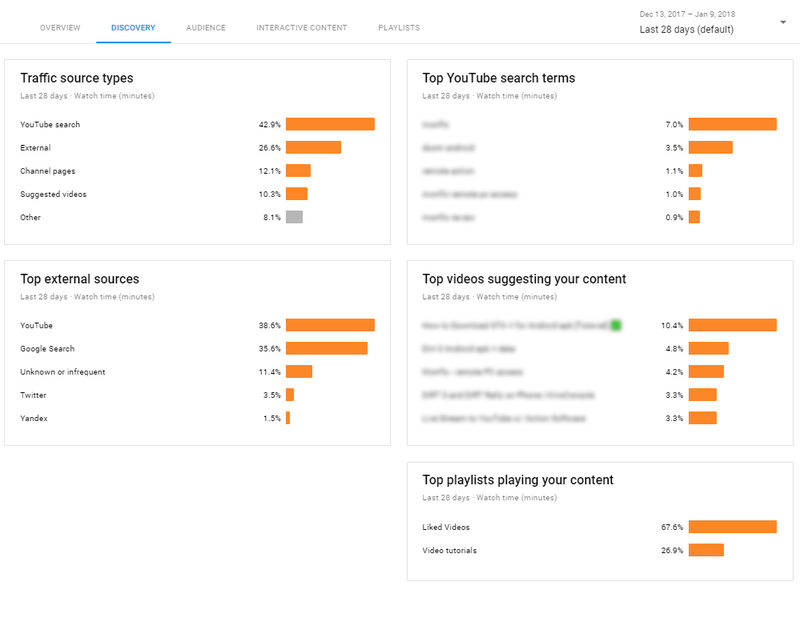 Other charts present in Discovery tab are: Top YouTube search terms, Top videos suggesting your content and Top playlists playing your content. You have a channel with tutorials and guides, or simply you have a problem-solving content on your YouTube channel. In this case you might want to aim for high external source types entries, especially from Google search engine. Currently, Google starts to favour answers to questions in form of a videos rather than simple text, that’s why nowadays you can find videos in a first position of Google search. Otherwise, people tend to search the answers via “videos” tab in Google. You have posted a video and titled it in a way that seems very accurately to you. By checking your YouTube search terms you can find whether your video is searched the right way. Very often people give incorrect, misleading, clickbait title to their videos due to which video isn?t watched for long enough (ie. isn’t on the topic and/or doesn’t provide answer). You have a gaming channel and see that most of your viewers aren’t of age. You might want to consider watching your language when recording videos especially when you have younger audience. If most of your viewest come from one country (even though you speak English but you are non-English speaking channel) you might want to switch to mono-language channel completely. Or on the contrary, seeing those statistics and realizing that for you personally so many people from other country watch your content, you might want to try and expand your channel in various ways. On playlists tab you can find following tabs: Number of times playlists were viewed, Top playlists, Video views in playlists, Average time in playlist. For some channels those statistics are especially useful. Music channels make lots of playlists with various types of music – thanks to those statistics they can check which playlist and music type is listened to the most – they can invest this way more time and effort to improve upon that playlist with better music. That’s all YouTube Analytics provides to its users. The possible amount of information you may gather from it is impossible to count. Comparing various charts together may lead to various conclusions. You must decide for yourself which statistic is the most important to you and then think about “how to improve this situation”, Hope you find this list educating.